Sometimes, when I hit a bit of a creative wall, I challenge myself to just go on and do something. Write that poem. Start that story. Write a song. 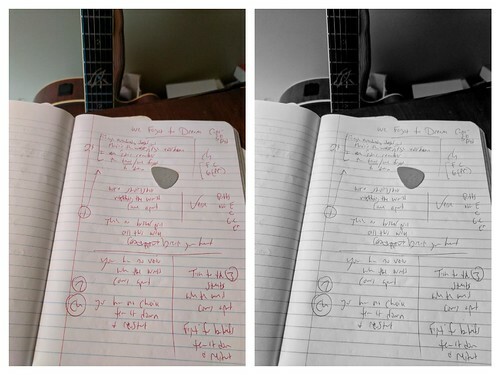 On Sunday afternoon, I decided I wanted to see if I could write and record a demo of a new song, all within 24 hours. With that impetus, I got to work, huddling over my guitar and notebook paper, scribbling and scratching out lines as a phrase “we forgot to dream” became the hook. I knew the song would be inspired by the recent elections, but I didn’t want it to be an overt political song. More like a reminder that even when things take turns to the worst, there is always some hope for change. And that there have been difficult times before. We made our way forward then. We can do it, again. It won’t be easy. It never is. But we can do it. This was the theme I was working towards. I do get a bit obsessive when writing a song. Sort of a hermit in the house, riffing the same chords over and over on guitar (my poor family) as I work on rhymes and meaning, and structure. I revamp and re-arrange words and phrases and verses and choruses, and then I walk away from the guitar and paper, silently singing lines in my head, remixing rhythms. I wander the house and the rest of the day like some madman, whispering poems to himself. Late Sunday night, I went back to the work on the song and hit a wall. I found that I had forgotten the basic rhythm of the song from earlier in the day. In fact, I got so frustrated with myself (one, for forgetting what I had written, and two, for not doing a quick raw demo when I first started, which I often do, as a listening post) that I had to walk away and call the songwriting challenge quits. By morning, my mind have found the threads again, though, and began weaving me back to the song. Thank you, sleep. When I picked up the guitar yesterday morning, the phrases all clicked into place again, as easy as you can imagine, as if I had never stepped away from the song at all. I can’t explain that process. It’s a strange and wonderful mystery. So I set to work on recording what I had written. First, I began by finding a beat, and then I went about recording the guitar, and then, the vocals. Oh, these vocals. I don’t like the way I sing this song at all. It’s a bad key, or something. But I never really like my vocals. I worked to add effects, to give the voice a silo-like, garage effect. Bleh. Still, I kept moving forward with the recording, finishing the voice, and then adding percussion and then topping it off with some guitar power chords. A little after 24 hours after I was done, the demo of the song, entitled “We Forgot to Dream” was done. For now. This entry was posted in Movies, Slice of Life, Songwriting. Bookmark the permalink. I would call the process “musical faith”. It is a strange energy.